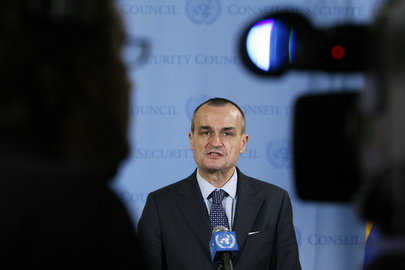 UNITED NATIONS, September 16 -- After Mahmoud Abbas announced that the Palestinian Authority will submit an application for full UN membership on September 23 to the Security Council, French Ambassador Gerard Araud was asked about the rules of the Council's membership committee. "It is irrelevant," Araud said, waving dismissively. "It won't come to us." The comment was noteworthy -- and in today's day and age, Tweetable. Soon thereafter, Araud came to the more formal televised stakeout and backed away or backpedaled from his earlier comment, saying that it is entirely up to the Palestinians what to do, and he'd only said it was irrelevant because they had not yet made their move. But what about the prediction, "It won't come to us"? While the prediction might be right, it appears from the Tour de France backpedaling that Araud would rather be politically correct than be Nostradamus. Later, specific answers were provided by other Council delegations to the procedural questions. The same 15 Council members first sit as a membership committee, in which no one has a veto. But their recommendation must go to a regular Council meeting, at which any of the Permanent Five member can veto Palestine's application. US Ambassador Susan Rice told the press that there's "more than one," even "several" Council members "skeptical" of an application for UN membership by Palestine. Germany's position has been criticized in advance, for example. But perhaps, as Araud said before his Tour de France backpedaling, "it won't come to US." Watch this site.